Yes, on an athletic scholarship. Organizational/Corporate Communication: I chose this major because I have a passion for public speaking and interacting with people. 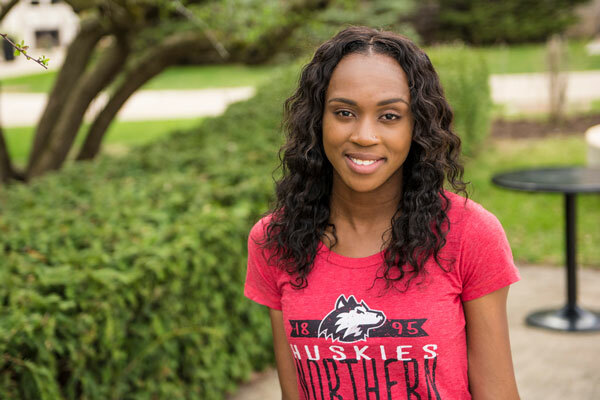 How did you learn about NIU, and why did you choose to attend? I learned about NIU through my high school coach, a former Olympian. Are you involved in any activities at NIU? What else do you do for fun/hobbies in your spare time? I am a part of the women track and field team. In my spare time I like to watch TV shows or hang out with friends. What has been your favorite event at NIU, and why? My favorite event would be the career fairs. I love it because I get to speak to and connect with potential employers. What do you like about our campus and community? I like that it is a very diverse campus and I have met some truly amazing beings since I have been here. What has your experience inside the classroom been like at NIU? I feel like my experience in the classrooms help prepare me for the future. I have engaged in many discussion-based classes and I love that atmosphere because it makes me learn better. What is something you have experienced at NIU that you will be able to take with you into future endeavors in your field? I learned how to work with a variety of different people and how to do so effectively. This will help me in my future career as most things will be done through exceptional teamwork. Would you recommend NIU to others and why? What’s a general piece of advice you’d give to someone starting college? Yes, I would recommend NIU to others because it has a friendly environment. The resources here are beyond exceptional and aid your success. My advice would be to take your time. Do not think that you have to have everything all figured out by the end of freshman year. This experience is all about growth. Embrace it and don’t drive yourself to insanity. What is up next for you after your time at NIU? Any career aspirations you would like to share? I plan to do continue on to graduate school and complete an MBA. Any family or other loved ones you would like to mention? I would like to mention my father, who gives me my space to blossom into the woman I aspire to be. Jehvania won the triple jump for the second consecutive season at the Mid-American Conference Indoor Championships in Feb. 2019.